Before the 1970s, well fixed specimens of gastric mucosa were rare. Then the flexible endoscope was introduced. This enabled gastroenterologists to take numerous well-fixed small biopsies from the stomach. 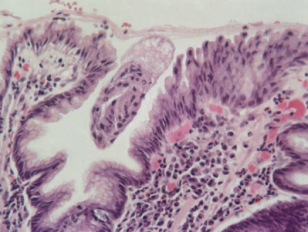 Gastric histology and pathology were clearly demonstrated by Whitehead in 1972, including a feature he termed ‘active’ gastritis. This description involved only the superficial gastric epithelium, with polymorph infiltration and epithelial cell distortion. In June 1979 I was examining a gastric biopsy showing chronic inflammation and active change. A thin blue line on the surface showed numerous small curved bacilli. These were clearly visible with a Warthin Starry silver stain. They also appeared to grow on the surface of the foveolar epithelial cells. Over the next two years I collected numerous similar cases. The changes were often much milder or more focal than the original biopsy, but the main features were usually similar, with chronic gastritis and usually some of the active change. These features could show considerable variation, from near normal to severe.